With credit cards quickly overtaking cash, having a reliable piece of plastic in your pocket is more important than ever. But, with hundreds of credit cards on the market in Australia, picking the right fit for your money is no easy task. Mozo recently held our annual Mozo Experts Choice Credit Card Awards, and delved into just what makes a top notch credit card. Our experts analysed 190 credit cards from 65 Australian credit card providers, to find the top performers in 14 different categories. “What the research and analysis we did for these awards really showed is that there’s a card out there for every spender - but to find the right card, you need to sift through a heap of options,” says Mozo Data Services Director and one of the Experts in question, AJ Duncanson. So if you’re in the market for a new piece of plastic, make sure you take a look at this comprehensive guide to all things credit cards. Already ready to start comparing cards? Start comparing in the table below. Knowing what types of credit cards are on offer is the first step to equipping yourself with the right one. The problem is, there are tonnes of them! To help you break it down, take a look at our table below. 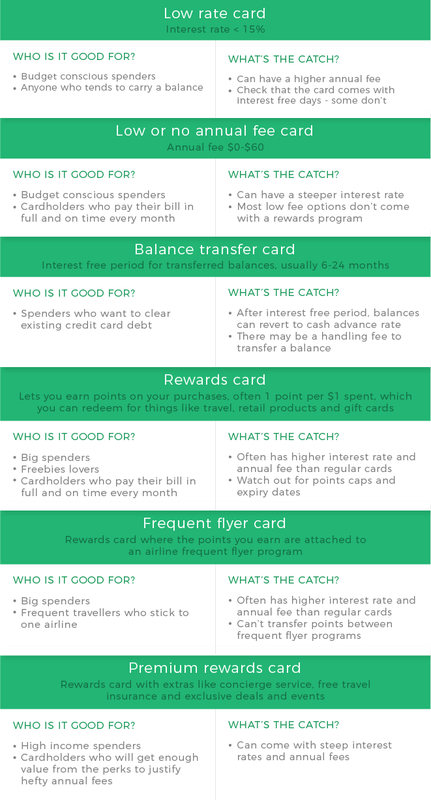 Still not sure which type of credit card is the right fit for your wallet? Check out our full Which Credit Card is Right For Me? infographic. Once you’ve identified the type of card that’s right for you, you’ll want to know all about the key features it comes with. From interest rate to the minimum payment, these are the things that every card has, and make up the foundations of how you will spend on your plastic - and how much it could wind up costing you. “Getting the basics right when you choose a credit card is so important. For example, a competitive purchase rate can be the difference between being able to pay off a lingering balance and winding up with a stack of debt,” said Duncanson. With that in mind, we’ve broken down the need-to-know aspects of a credit card that you should consider before adding one to your spending arsenal. The purchase rate, sometimes just referred to as the interest rate, is how much interest you’ll pay when you buy something with your credit card and don’t pay it off within the interest free period. According to the Mozo database, purchase rates can range from just 8.99% up to 24.99% p.a. Most cards, but particularly high end or rewards options, come with an annual fee attached. This can often range from as little as $39 on budget-friendly options, right up to a massive $749 for the most expensive premium credit card. The annual fee is designed to cover the cost of the perks and points on offer with that card - so generally the more freebies you can claim with a credit card, the higher the annual fee is likely to be. When you make a purchase on your credit card, you’ll usually have up to 44 or 55 interest free days in which you can pay off your balance and not be charged interest. We’ll cover interest free days and how they work more in-depth below, when we cover how credit card interest works. This refers to the minimum amount you need to pay off your credit card balance each month to avoid a late fee. It’s often the highest of either a flat amount ranging from $5 to $100 or a percentage of your balance, usually somewhere between 2% and 10%. Already lugging around credit card debt? You might choose to clear this black cloud by snapping up a balance transfer offer on your new credit card. The balance transfer rate is the interest rate you’ll pay on the balance you transfer from an old card - it’s usually much lower than the purchase rate, and can often be 0%. If you get cash out at an ATM with your credit card, you’ll pay interest on that amount at the cash advance rate. This is usually higher than the regular purchase rate - often around 20% and sometimes even as high as 29.49% - and you start paying this interest immediately, without the benefit of interest free days. For this reason, cash advances can quickly become an expensive habit, so try to steer clear of them. As well as the interest you’ll pay on a cash advance, you’ll also be hit with a fee. These fees can be as high as 3.50% of the transaction amount, which can get pricey if you withdraw large amounts or head to the ATM frequently. Sometimes also called the currency conversion fee, the foreign exchange margin is an extra fee you’ll pay your credit card provider if you buy something in a currency other than Aussie dollars, for example, while online shopping at a US website. Extended warranty. Purchases made on your credit card can come under an extended warranty policy which might be up to 12 months extra, on top of the regular Australian manufacturers warranty period. Purchase protection. Walk out of the store and drop your new iPhone? If you bought it on your credit card, it may be covered under this insurance, which protects you against loss, theft or accidental damage on your credit card buys. Price guarantee or price protection. If you buy something on your card and then find it cheaper elsewhere, you may be able to have the difference refunded to you. There are a few conditions to this one, including, that the lower price needs to be a printed advertisement for the exact same product, and it has to be a certain amount lower than what you paid (for example, $75 less) so make sure you read the fine print. International travel insurance. If you’re travelling overseas, you may be able to cash in on complimentary overseas travel insurance thanks to your credit card. This is often only available on premium options and you’ll need to make sure you take the necessary steps to activate your cover. Interstate flight insurance. Less common but sometimes available with premium credit card options, this covers you for things like delays, cancellation, luggage or rental vehicle excess for short, trips within Australia. Transport accident insurance. If you travel on a licensed plane, bus, train or ferry, this complimentary credit card insurance will cover you for serious injury if there’s an accident. As with all insurance options, be sure to read the fine print on any of the above. While most credit card insurances are more or less just a nice bonus, in the case of travel insurance in particular, you may decide a standalone policy is better suited to your needs. The credit limit refers to the maximum balance you can have on your card at any one time. This includes purchases, interest charges and fees. If you go over the limit, your spend will likely be declined and you could even be up for a penalty fee. Minimum credit limits generally range from around $400 to $15,000, but they can stretch over $100,000 for Diamond or Black cards. How high your limit is will depend on things like your income, employment status, credit rating and repayment history. Every credit card has some level of security put in place to help keep you safe while spending. Both Visa and Mastercard have their own fraud detection systems, plus zero liability protection, which means if you’re the victim of credit card fraud, you usually won’t be held accountable for that spending, as long as you do all you can to minimise the risk and report any problems as soon as possible. Visa, Mastercard, Amex - what’s the difference? When it comes to Visa and Mastercard, the answer is: not all that much. Visa and Mastercard are the two biggest credit card payment networks in the world. Although they are different, they offer very comparable services - you’ll rarely, if ever, come across an ATM or shop that accepts one and not the other. Usually, whether you wind up with Visa or Mastercard really depends on which one your bank has partnered with, for example, CBA offers Mastercards, while NAB offers Visa cards. Amex, on the other hand, is a little more of an outlier. Whereas Visa and Mastercard don’t directly issue their own credit cards, American Express does. These cards often come with higher merchant fees and are still not quite as widely accepted as Visa and Mastercard. But the upside is that Mozo research shows that Amex cards consistently come out on top in terms of the value of rewards point earn. Credit cards are notorious for slapping spenders with interest charges that can quickly build up. But here’s the good news: for the most part, you can avoid paying interest on your credit card entirely if you manage your balance properly. The key is understanding how interest works and making the most of your interest free period each month. As mentioned above, most credit cards come with a number of interest free days (there are exceptions, but not many). So when your credit card bill comes in at the end of the month, you’ll still have an interest free period in which to pay off the balance. Interest free days start at the beginning of your statement cycle (often the start of the month), not when you buy something. So if you make a purchase halfway through the month, you’ll have fewer interest free days than if you buy at the start of the month. The interest free period doesn’t apply to cash advances. If you are carrying a balance on your card, you’ll usually forfeit your interest free days for the next month. So to stay interest free, you need to pay off your full bill before the due date each month. Did you know that Aussies carry an average of around $4,200* of debt on their credit cards? And with credit card interest rates averaging 17.22%, that lingering pile of debt can become a mountain in no time flat. But there is a solution: a balance transfer card. When you pick up one of these cards, you can transfer an existing balance onto it, with the idea of paying it off during an interest free period. Sounds good right? Well, it can be, as long as you have an airtight plan for how to blast your balance within the given time frame. If you don’t, you’ll wind up paying the revert rate on your debt, which is often equal to the cash advance rate. As we said above, this can often be as high as 21.49%, so you want to avoid this fate. Here are some steps to make the most of your 0% interest period. Crunch the numbers on your debt. First things first, work out how long it will take you to pay off your credit card debt. For example, if you have a balance of $4,000 and choose a card with 12 months interest free, you would have to pay at least $340 each month to smash your debt. If you can’t afford to pay off that much each month, you may need to search around for a longer balance transfer offer. The interest free period is usually between 6 and 24 months, and your goal should be to clear your debt before this period ends. Choose a BT card. Next, choose the right balance transfer offer for your budget. You can use our debt payments calculator to work out whether the card you’re considering is a good fit. If you’re planning to use the card after you wipe away debt, it’s also worth considering whether the regular interest rate, annual fee and other card features are right for your future spending. Set up automatic repayments. If you can budget for it, setting up automatic repayments to knock a certain amount off your balance each month, week or fortnight is a great idea. That way, you can stick to your debt payment plan without even lifting a finger! Don’t spend any more! This is important: while you’re paying off your debt, try not to put any more purchases on your card. New spends will be charged interest at the regular rate and any repayments you make will go towards this new balance before chipping away at your debt. Try spending on your debit card instead until you’ve mastered your existing balance. *Based on the RBA’s figure for total balances accruing interest, divided by the number of cardholders in Australia (RoyMorgan, June2015). Another good reason to carry plastic is that you can cash in on some excellent rewards, freebies and perks. But it’s important to know what you’re getting into when you pick up a rewards credit card, because Mozo research has shown that in 2017, the average net value of a rewards card was just $27. “When choosing a rewards card, it’s vital to take into account the cost of the annual fee, because it can put a serious dent in the value of the card. In fact, in some cases, the annual fee not only cancels out the value of rewards points, it actually means you’re losing money by keeping the card,” Duncanson said. When it comes to points, 1 reward point for every $1 you spend is a pretty standard earn rate. It’s also a good idea to keep an eye on bonus point offers - which are usually available when you sign up - and special earn rates. For example, on some frequent flyer cards, you’ll earn double points when buying the airline’s products. Other cards offer double or even triple points when shopping at certain retailers, or at big supermarkets. So be sure to read the fine print and make your purchases count! Other things to look out for include points caps and expiry dates. The number of points you earn could be capped at a monthly or yearly amount - if this is the case, try to spread out any big spending to stay under the points cap. If your points have an expiry date keep a careful watch on how long you’ve got to use them and be sure to cash in before it’s too late! To find a rewards credit card that’s geared toward the freebies and bonuses you really want, don’t forget to take our Rewards Revealer tool for a whirl. Are you an avid online shopper or got a case of wanderlust? “These days when online shopping is so popular and everyone’s keen for an instagram-worthy holiday, a credit card that works for international spends is a must-have,” says Duncanson. Foreign exchange margin - when you spend on your card and the money needs to be converted either to or from Aussie dollars (for example, if you’re in the UK and the Aussie dollars you would usually be using must be converted to pounds) you may be charged a fee. Usually, this is a percentage of your spend, between 1% and 3.65%. But you can find travel-friendly credit cards that don’t charge any currency conversion fee - so choose your holiday plastic carefully! International travel insurance - one thing you might want your travel credit card to include is complimentary international travel insurance. Remember that if your card does include this perk, you’ll need to make sure you activate cover (usually by prepaying a certain amount of your travel on the credit card.) It’s also worth considering whether credit card insurance is sufficient for your trip, or if a standalone policy would suit you better. There are credit cards designed specifically with travellers in mind, so check out our travel credit card comparison to find a piece of plastic to pack in your carry on. One of the good things about having a credit card is that it can help you to build up a good credit history, which will come in handy when you go to apply for a personal loan or mortgage in the future. In a nutshell, this boils down to: do you pay your balance off in full and on time? Australia has recently shifted to a comprehensive credit reporting model, which means banks looking into your credit report can see more of your payment history - good and bad. Although it’s less important, how long you’ve had access to credit also comes into play. A short history of using credit cards or loans has less of an impact on your credit score, while a long history shows more of how you act as a borrower. Your credit utilisation is how much of your available credit limit you’re actually using. So, for example, say you have a couple of credit cards with a combined credit limit of $8,000. If you buy a new TV for $800, your credit utilisation is 10%. If you then buy a $1,000 laptop, your credit utilisation goes up to 22.5%. The general consensus seems to be to keep your credit utilisation below about 30%. So, now that you know the ins-and-outs of credit cards, you’re ready to choose one for your wallet. If you’re ready to dive right in, you can head over to our credit card comparison tool to search through Mozo’s entire database. If that sounds a bit overwhelming, then why not start by checking out a select few Mozo Experts Choice winners in the list below. You can learn more about Bank Australia’s credit card here. Head over to our review page to find out more about the American Express Essential card. Find out more over about the ANZ First card here. Head over to check out the details of the Coles Rewards card here. Head over to our review of the Virgin Money frequent flyer card to learn more. Take a look at the details of the American Express Qantas Discovery here. Find our more with our review of the American Express Qantas Ultimate. Don’t see a piece of plastic you absolutely love? Head over to check out the full list of our Experts Choice winners. Your ID. This can usually be in the form of a driver’s licence, passport, Medicare card or proof of age card. Proof of income. Have payslips or bank statements from at least the past two months. These help the bank establish that you have the finances to pay off your spend, and will also help them determine your credit limit. Your employer’s details. Make sure you have your employer’s name, address and phone number handy. If you’re self-employed, you’ll need to supply your accountant’s contact details instead. Details of your current finances. The credit card provider will want to see a record of your spending and saving, rental payments, assets and a list of any liabilities you have - which can include other credit cards, loans or any other debt. They may also ask about your dependents (for example, children or spouses) and their spending habits. If you’ve got everything sorted out before you start, applying for a credit card can take as little as 15 minutes, and you can get your new plastic in 5-10 working days, depending on which bank you’re with. While choosing the right credit card for your needs is super important, the job’s not done once you’ve applied and received your new piece of plastic. You still have to keep using your credit card responsibly every time you take it out of your wallet. Always pay your bill in full and on time. The number one rule of a credit card - clear your balance! By paying off your entire balance (and not just the minimum repayment) before your interest free days run out every month, you won’t have to pay interest. In this way, a credit card can be a really handy tool for managing a budget, keeping track of spending and cashing in on perks like extended warranty. One way to make sure you always pay your bill is to set up automatic payments. Don’t spend more than you can repay. One of the handy things about a credit card is that it allows you to spend more money than you have on you at the time. But that doesn’t mean you should be spending more than you can reasonably expect to pay back. If you’re putting a purchase on your credit card, it’s a good idea to already have a rough idea when you’ll be able to pay it off. If you’re going to have to carry a balance for a month or two before you can get rid of it, remember to factor the interest charges and the fact that you’ll forfeit interest free days on other purchases into your payment plan. Avoid the ATM. When it comes to your credit card, cash advances are a killer. Between fees and interest, that quick trip to the ATM can wind up costing you way more than you bargained for. Try to reserve your credit card for situations where you can use plastic at the checkout, and when you need cash out, reach for a debit card instead. If you’re struggling, seek help straight away. Finding it hard to meet the minimum repayments? Watching interest pile up with dread? Resist the urge to stick your head in the sand and instead, give your credit card provider a call right away. There are hardship programs that can help you out with managing your balance and setting up a payment plan. Review your card regularly. What works for you at one point in your life might not work later. For example, when you’re just starting out, a low rate credit card might be the best choice. Later on, when you’ve got a bit more flexibility in your budget, a rewards card might start to look more attractive. Plus, credit card offers change all the time, so it’s a good idea to keep an eye on the market, so you don’t miss out on a better value piece of plastic. Make sure you compare credit cards on a regular basis, and see if your plastic is still up to snuff. Still didn’t find the answer you’re looking for? Believe it or not, we’ve got even more information on all aspects of plastic, from avoiding credit card fraud, to choosing a credit card for a pensioner. Check out our credit card guide section to learn more. Disclaimer: Mozo may receive advertising fees from the financial institutions, issuers of financial or credit products and third party advice providers that are shown on this page. These fees are based on a cost per click, cost per acquisition, or a fixed fee.